Every day, VERTEX’s Forensics team assists insurance carriers and law firms with numerous claims on various building and property issues. Two recent homeowners’ insurance claim investigations have concerned drainage from adjacent neighboring houses and developments. These claims serve as excellent reminders to be mindful of the effects of hydraulics, water flow, and stormwater management at private and public properties. Hydraulics can be defined as the analysis of water as it moves through a conveyance system. These systems can include pipe networks, culverts, natural channels, and more. Of particular interest to forensic investigations, hydraulics can inform items such as flood mapping and design and analysis of items such as storm drains, basins, and culverts. Stormwater management is crucial when drainage resulting from wet weather (rain, snow, and/or ice storms) needs to be directed sufficiently away from a property. Improper or inadequate drainage can result in flooding of homes, settlement of structures, and/or development of sinkholes due to excess moisture. Some materials, known as pervious surfaces, have the natural ability to retain/absorb or filter moisture. These include vegetated areas, non-compacted soil, sand, and gravel. Materials with little to no absorptive properties (known as impervious surfaces) can include asphalt driveways, concrete sidewalks, stone or brick pavers, and roof coverings at a residential property. Stormwater management systems can involve specifically-designed isolated stormwater systems or a combined drainage system that includes sanitary sewer lines. The effect of concentrated discharges versus continuous flows of moisture, even after being detained, can result in different forms of damage, including: erosion, wrested vegetation, and ditches/channels within soil. Stormwater management systems can utilize various features to convey and/or detain water, safely and securely. Mechanical options can include pipe storage, cisterns, and proprietary devices such as Stormceptor. Several geological/land-based features include retention and detention ponds, easements, and swales. An easement or swale are permanently sloped portions of land that can pass through private properties. The easement or swale serves as an open channel to direct stormwater towards culverts, ponds, etc., in a weather event. In some municipalities, private property owners are expected to maintain the easements or swales by adequately trimming grass or small vegetation to preserve the water flow through the easement. A watershed can be defined as the area of land that provides the source of the stormwater during a weather event. Basic hydraulic calculations such as the Rational Equation (Q = C*I*A; where Q = peak flow, C = runoff coefficient, I = rainfall intensity, and A = area of watershed) can be used to verify the adequacy of existing drainage systems. In a recent claim investigation, VERTEX used this equation to help determine whether reported flooding at a Claimant’s home was solely due to drainage runoff from a blocked drain at the next-door neighbor’s (Insured’s) yard versus drainage from the rest of the neighborhood. Runoff coefficients are based on the permeability of the materials at the property, and rainfall intensity can be based on weather data for a specific day, if known, or historic data. VERTEX utilized this weather data, our observations, and hydraulics to verify that the amount of reported flooding at the house by the Claimant was much greater than the combined amount of rainfall that was collected at the Claimant’s and Insured’s yards. This data was crucial in our forensics report and subsequent trial testimony concerning this claim. The maintenance of an easement/swale by a private property owner can be a debatable issue that can be subject to the enforcement of the local jurisdiction. In a recent claim investigation, VERTEX was asked to determine whether settlement of the house and a possible sinkhole that developed on a Claimant’s property was the result of improper maintenance of a swale on an adjacent private property (Insured). As the neighborhood changes with time, the amount of drainage conveyed within the swale can also change due to the addition of impervious areas and/or newly-added drainage systems upslope. History of the neighborhood and the watershed surrounding the swale is notable in this situation. Recent construction of new housing developments and alteration of surrounding wetlands can influence the amount of stormwater drainage in a swale. VERTEX reviewed available online historic aerial photographs to determine a timeframe of relevant changes to the swale’s watershed when local government documentation and firsthand knowledge were not readily available. 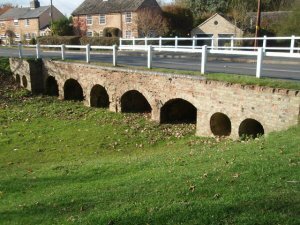 VERTEX’s forensic report educated our client and shifted the focus of subsequent investigation away from the Insured’s actions and more towards the municipality and building developer’s role in alterations to the pre-existing swale design. To learn more about VERTEX’s Forensic Engineering or Engineering Design services, call 888.298.5162 or submit an inquiry.